Norway and Oslo. Tourist Information and Hotels in Oslo. Self-drive Holidays in South-East Norway and Oslo for the Independent Motorist. South-East Norway is a land of contrasts. In the south the coast is a succession of lovely coves, islands and inlets, dotted with quaint fishing ports. Oslo is at the northernmost point of this enormous arm of the Skagerrak. Inland the scenery becomes progressively wilder and more mountainous, culminating in the wilderness which includes the Jotunheim, Rondane and Dovrefjell national parks. 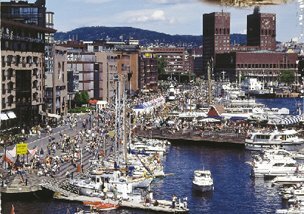 Oslo, the capital city of Norway, enjoys a beautiful situation at the head of the Oslofjord. Behind the city are forested mountains, easily accessible by public transport, with many miles of walking trails. These become cross-country ski trails in winter. Or you can explore the many islands and coves in and around the fjord, all served by boat. Indeed, Oslo's excellent integrated transport system makes it pleasant and easy to journey around the city and its surroundings. For a big city the centre is strangely (for British visitors) free of cars, and they are further discouraged by having to pay a toll of 15 kroner to enter the centre. Just outside the city, well-served by public transport and the starting point for many countryside excursions, is the world famous Holmenkollen ski jump. And make sure you visit the astonishing Vigeland Sculpture Park, a short tram ride from the centre. A lovely park and some wonderful statues. There is a sense of space in Oslo centre, with wide streets and gardens, although the buildings are rather austere in style, and the only part with any real architectural character is around the port and the long wooden quay known as Aker Brygge, where you'll find a fascinating mixture of the old and the new. This is also the best place to visit in the evening when the many bars and restaurants are busy with locals and visitors. But beware - prices are high here, with beer costing around 5 a litre and a bottle of table wine around 20. The Jotunheimen National Park is wild and beautiful. There are many kilometres of walking trails, but it's not an area for the inexperienced, as the park contains over 200 peaks more than 1900 metres in height. However, both major roads 51 and 55 skirt the park, so if you choose this less energetic way of visiting you'll still be able to enjoy the spectacular scenery. Driving south from Oslo, avoid the E10, and, if you've got the time, follow the pretty coast road past the holiday homes of many Oslo citizens. Between Arendal and Kristiansand is a delightful coastline of sandy coves, rocky bays and small villages, all set against a back-drop of forested hills. 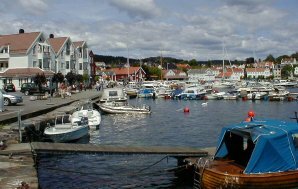 Lillesand is a pretty and popular holiday resort, with a lively tourist office and plenty of walking and water-based activities. Kristiansand is more than just a ferry port, and is also an important holiday destination, enjoying good sandy beaches and with lots to do both by day and night.